Criminal defense trials, whether fictionalized accounts on television or in the movies or the real life versions, usually end in one of three ways – a guilty verdict, a non-guilty verdict or a mistrial. The first two are self-explanatory. But what exactly constitutes a mistrial? Hung jury: Probably the most well-known reason for a mistrial. A hung jury occurs when all 12 members of the jury cannot agree on a verdict, and no amount of further deliberations will change anybody’s mind. The judge usually orders the mistrial on his own in these situations, as opposed to the prosecution or defense filing a motion. Juror misconduct: Either side may request a mistrial if there is evidence of juror misconduct. This may include discussing the case with other jurors before deliberations begin, using evidence not admitted at trial to influence their decision, discussing the case with non-jurors or having contact with any of the parties associated with the trial outside of the courtroom. Death: A mistrial can be declared if a juror (if there are no alternates) or attorney dies during trial. Tainted jury pool: If a juror lies during voir dire – the pre-trial phase where the prosecutor and defense attorney question the potential jurors prior to jury selection – the jury pool can be considered tainted and may be grounds for a mistrial. Lies or omissions by a juror that could cause a mistrial include failure to disclose a relationship (personal or otherwise) with any parties to the case, including witnesses; having been a victim of the crime the defendant is accused of committing, or; having already formed an opinion regarding the defendant’s guilt or innocence. Prejudice to the defendant: If something occurs at trial that is so prejudicial to the defendant that he can no longer receive a fair trial, and a judge’s admonition to the jury to not consider that information is not enough to erase it, a mistrial can be declared. Actions that can cause such prejudice include improper remarks made by the prosecutor during his opening statement, or a witness testifying to highly inflammable, but irrelevant, acts by the defendant. 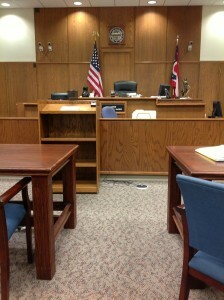 If a criminal case ends in a mistrial, the prosecutor may be able to retry the case. Whether or not this is possible depends on the reasons for the declaration of trial, and whether a retrial would violate the defendant’s right against double jeopardy, that is, the right to not be tried a second time for his alleged crimes. Whether double jeopardy attaches to prevent retrial is a complicated legal analysis that is generally taken up on appeal. In general, however, any case that ends in a hung jury can usually be retried. If you are arrested and charged with any felony or misdemeanor crime in Chicago or the surrounding suburbs, you need an experienced criminal defense attorney. That is why your first call should be to Chicago criminal defense attorney David L. Freidberg. Drawing on close to 20 years’ experiencing handling all criminal matters, Mr. Freidberg has the knowledge, resources and tenacity needed to successfully defend against the charges brought against you. With offices in Chicago, Skokie and DuPage County, a representative is available to speak with you 24/7. Pick up the phone and call us today at 312-560-7100, or complete our online contact form, to schedule your free initial consultation.